This upholstered sleigh bed has a regal look perfect for the princess in your life. 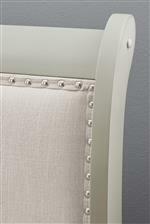 The headboard features nail head trim detailing, adding an extra touch of regal style to this twin sleigh bed. 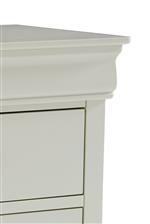 Thanks to its Light Gray finish and traditional style this piece will blend in your child's room from grade school to graduation. The Jorstad Twin Upholstered Sleigh Bed by Signature Design by Ashley at Sam Levitz Furniture in the Tucson, Oro Valley, Marana, Vail, and Green Valley, AZ area. Product availability may vary. Contact us for the most current availability on this product. The Jorstad collection is a great option if you are looking for Transitional furniture in the Tucson, Oro Valley, Marana, Vail, and Green Valley, AZ area. Browse other items in the Jorstad collection from Sam Levitz Furniture in the Tucson, Oro Valley, Marana, Vail, and Green Valley, AZ area.